Nice catch of dolphin on our sportfishing charter in Fort Lauderdale. It’s been a mixed bag on the reef this week. Tunas are biting strong on our sportfishing charters where we troll with natural feathers and rigged baits. Snappers are biting pretty good on our drift fishing trips and night anchor fishing excursions. We’ve had a few banner days this week and couple tough ones. May and June are great months for snapper fishing, which is what we’re targeting on our daily drift fishing trips. Yellowtails are biting in decent numbers, some really, really nice mangrove snappers are around and biting this month and some respectable catches of mutton snappers too. I would say the general rule is that the larger snappers bite during the day and the numbers of them are being caught at night. 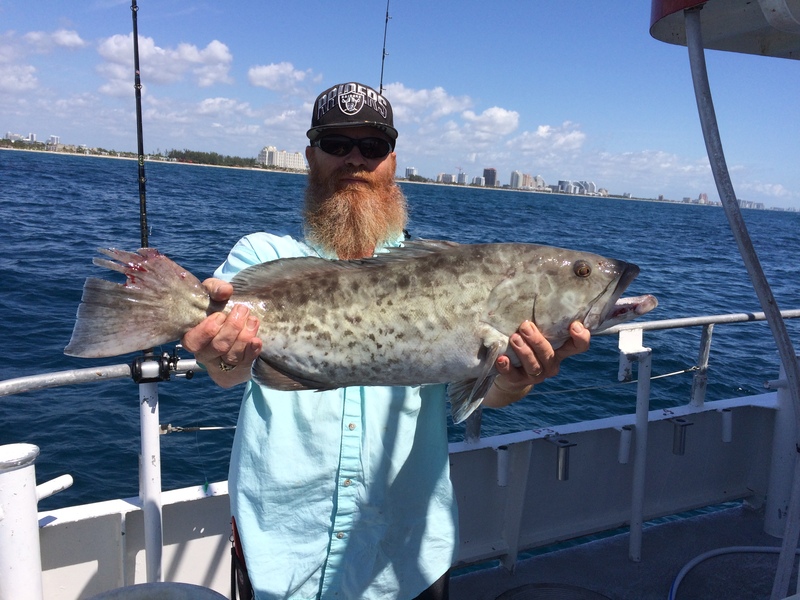 Groupers are out there and biting too. We’re getting into quite a few of the small rock hind and strawberry groupers and a few of the larger reef groupers… reds, blacks and gags. 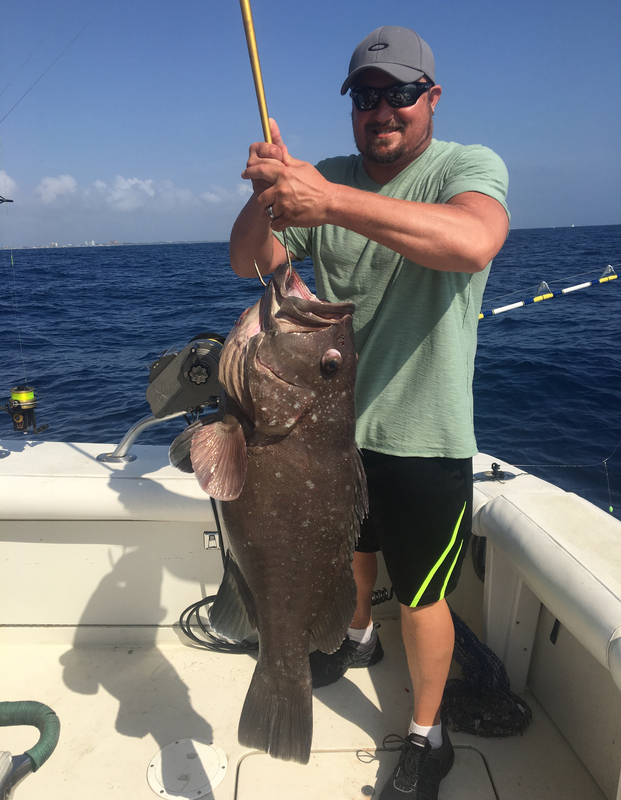 A lot of the groupers we catch are an inch or two short of keeper size but a few nice keepers are being caught on our drift fishing trips, especially during the day. 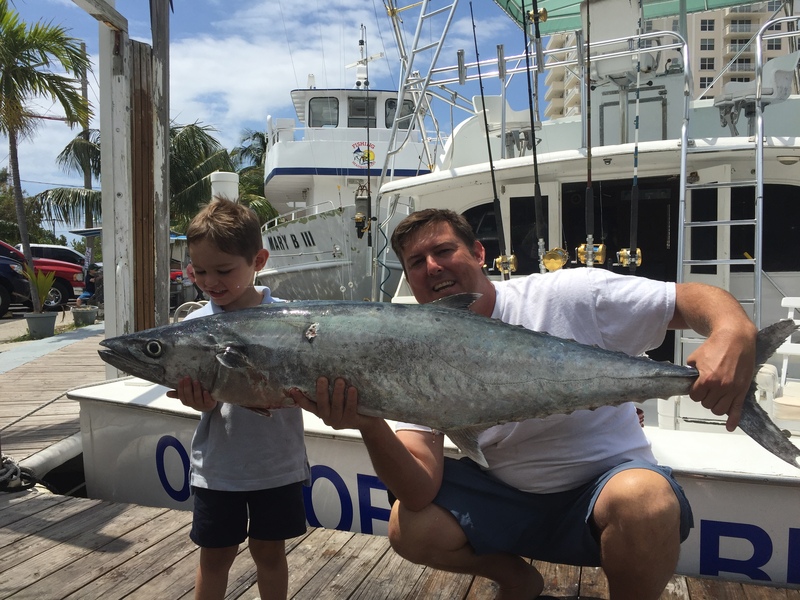 Huge kingfish caught sportfishing in Ft Lauderdale with kids. Sportfishing boats are catching most of their fish on the troll. Trolling natural feathers and rigged ballyhoo is generally good for the tunas that are showing up on the reef. If you’re lucky, you may hook into a mahi-mahi or wahoo on the troll as well. Kingfish are biting good trolling the reef too, with some bonitos mixed in. Trolling has been the magic ticket for catching fish on our sportfishing charters. It allows you to cover the most territory out there and try different depths and zones. Live baiting may start working a bit better this week with the wind picking up. Last week, we had very light winds if any. The past couple days we’ve had a stiff breeze. This may make for good kite fishing conditions. Nice pair of mutton snappers caught on our drift fishing trip. Wrecks are holding some nice fish. The jacks are very aggressive this time of year. Big amberjacks and almaco jacks are congregated around the wrecks this time of year. They are very aggressive, especially with live baits, and they get big, very big and they are strong. Jacks are one of our best gamefish that will give an angler an awesome fight, even on heavy tackle. Also, there are some very big groupers around the wrecks this time of year and you never know when one of them is going to bite. Cobias too, are a possibility, another big game fish we catch around the shipwrecks. And sharks, you never know what you may catch around our 200-300ft deep shipwrecks. Nice warsaw grouper caught deep dropping on our deep shipwrecks. 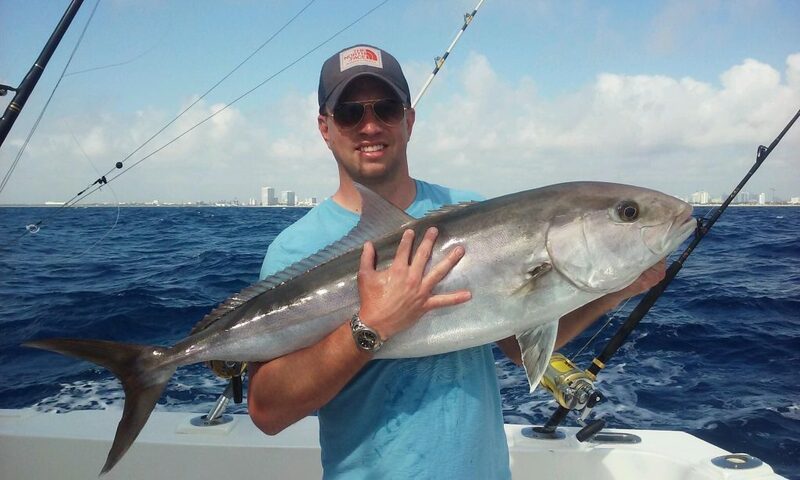 There’s a good variety biting on our Fort Lauderdale fishing trips. The months of May and June have a good majority of good trips with good action and some big fish. Summer months are good, but this is the end of the best time of year to catch our biggest game fish. 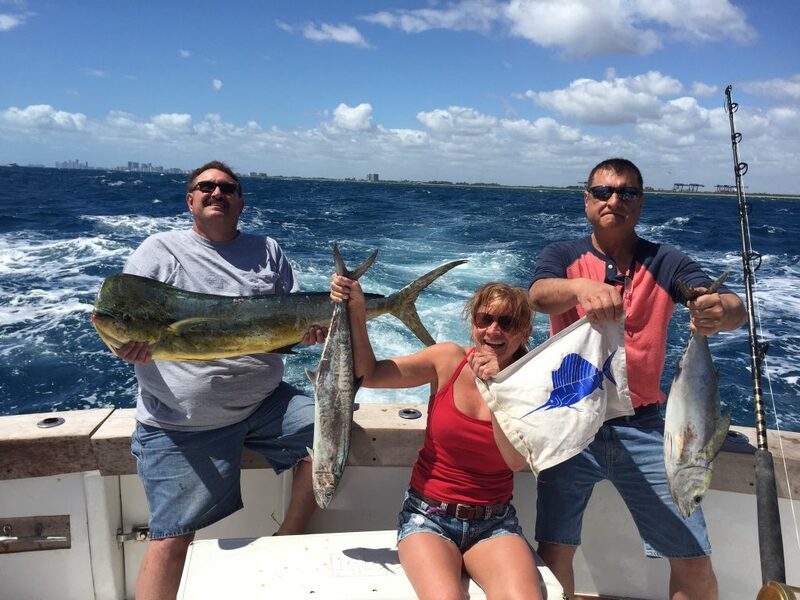 Come out on a fishing charter with us and let us show you why we are the best fishermen in Fort Lauderdale. Let’s go fishing! 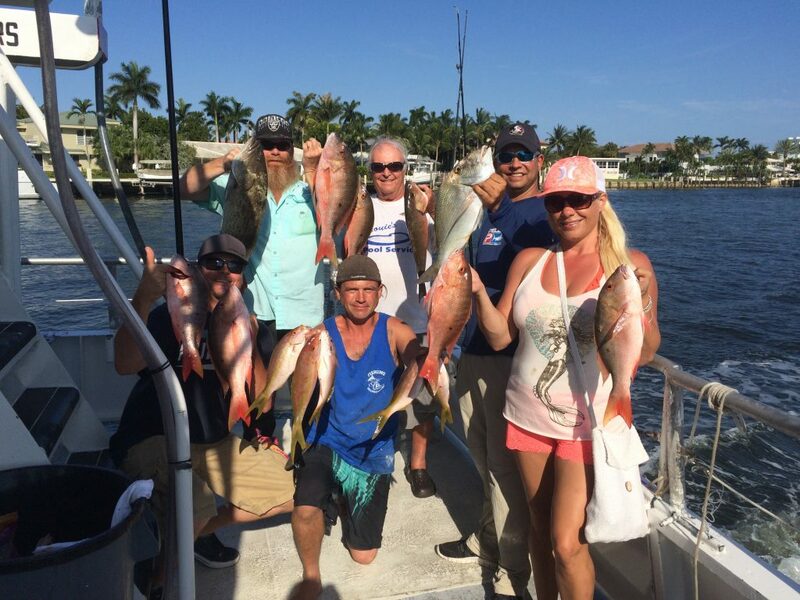 Nice catch of mutton snappers, yellowtail and grouper on our drift fishing trip. We had a tough weekend of fishing this past weekend, mainly due to the Pompano Rodeo tournament and all the boats fishing it. There was a lot of competition for fish over the weekend. But the fishing is already improving with good catches of snappers and other bottom fish on our drift fishing trips, some mahi-mahi starting to bite again and tunas/kingfish returning to the reefs. Our drift fishing trips aboard the Catch My Drift are seeing some good catches of snappers lately. Mutton snappers are biting in decent numbers, as well as yellowtails and mangrove snappers becoming more and more aggressive. May and June are known as the snapper spawn months in south Florida. The bigger, more cautious snappers throw caution to the wind as they venture out to feed and bulk up for their annual spawning season. We’re catching them good on both the day and night trips. Mixed in with the snappers are all the usual culprits of porgies, grunts, triggerfish and jacks. We’re getting a good variety of all sorts of good eating bottom fish, most of them keepers. Grouper season opened up just a few weeks ago and there are some monster groupers being caught out there. 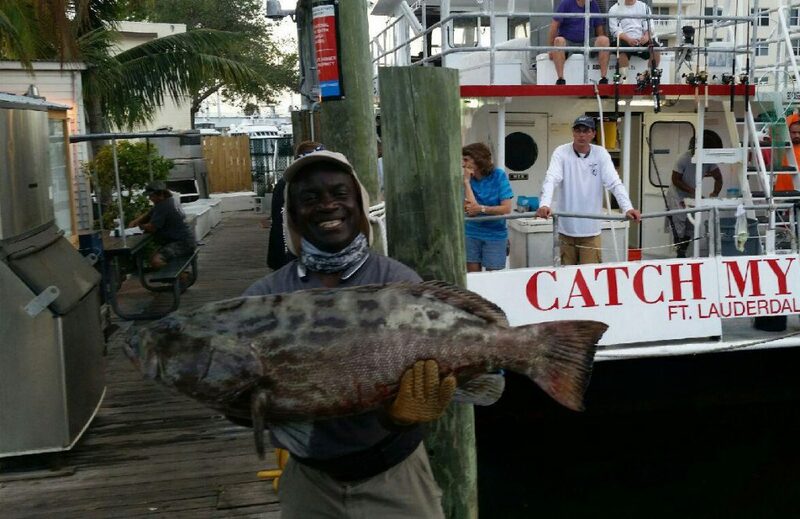 Gag groupers, blacks and reds are the main ones that we’re catching. The season was closed over the last 4 months, giving the groupers are good chance to recover in numbers and re-inhabit the local wrecks and reefs. We had to throw back a lot of nice size groupers over the past few months, but finally we can keep them again. Snappers and groupers are 2 of my favorite fish to eat, and many of our anglers come out in search of catching dinner. There is still a luck factor involved and we still have both good days and bad days in regards to the fishing, but your chances of coming home with some fish fillets has increased immensely this month. Cobia, a large reef hunter that likes to follow stingrays, turtles and other slow moving marine creatures are a possibility this month too. If you’re in search of catching a larger fish on the drift boat, try fishing a whole sardine bait with a lighter sinker than everyone else is using. Ask the mate to rig you up with the ‘hero or zero’ rig, he’ll know exactly what you are talking about. This rig is for fishing the mid-depth or surface water column rather than the bottom (where the snappers are). 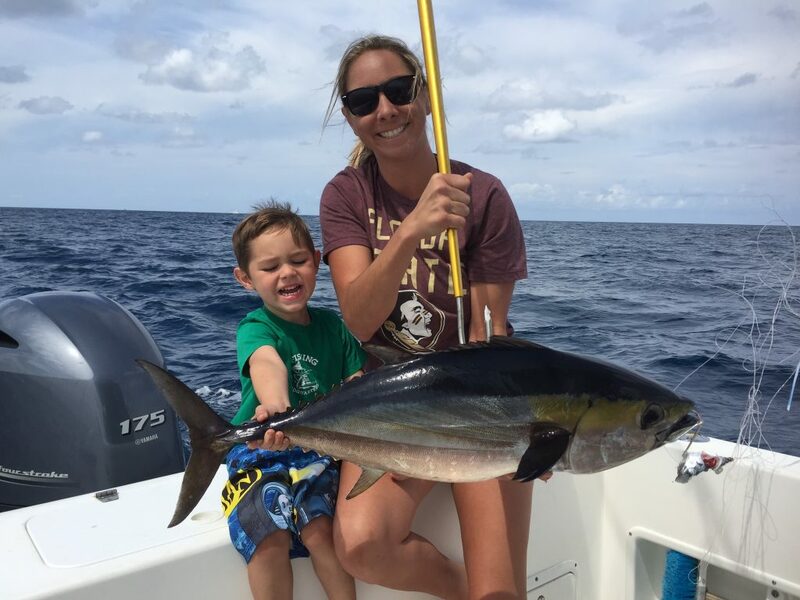 Although your chances at catching anything go down dramatically, if you do get a bite, it will be something big like a kingfish, tuna, mahi-mahi or cobia. This technique is not for those fishing for action but for those looking to try for bigger fish. They don’t always bite but when they do, you’re a hero! Sportfishing charters are doing very well too. The mahi-mahi are still around. 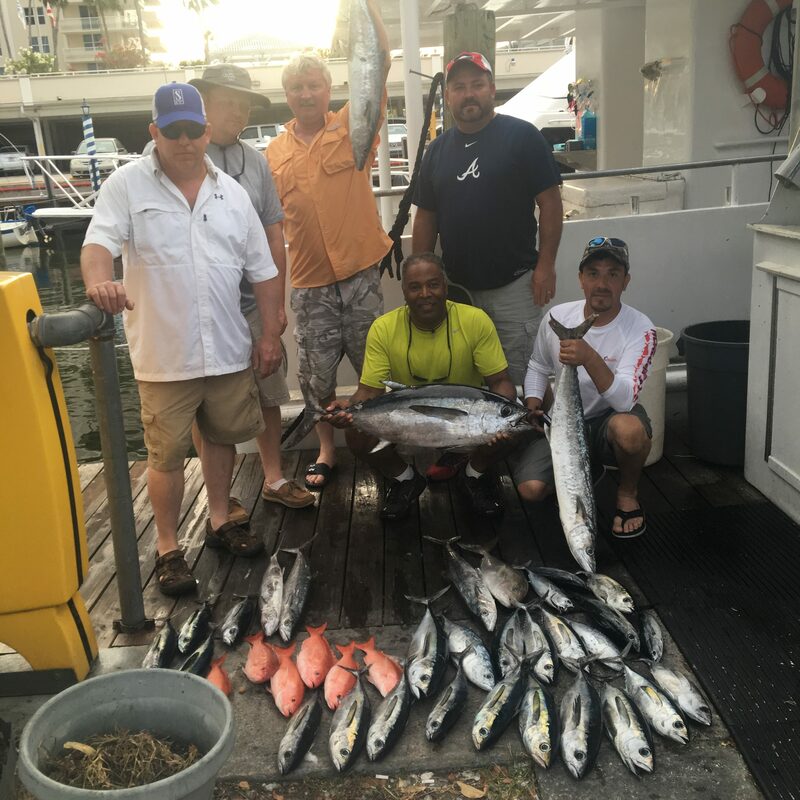 Although they got beat up pretty good during the weekend tournament, the best thing about fishing Fort Lauderdale is that we have the Gulfstream current here, which brings with it all the pelagic and migratory fish. Every couple of days a full new batch of fish arrive off our coast as they migrate northward using the Gulfstream like a big conveyor belt. 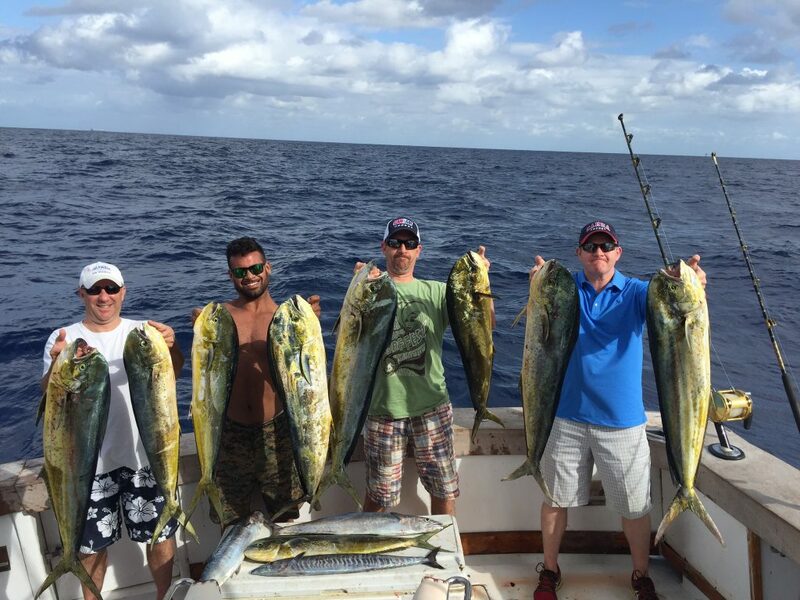 This is a great month to fish for mahi-mahi, tuna, wahoo and kingfish. Tunas are especially prevalent on the reefs this month. Most of them are smaller, football size tunas. These are still great eating fish and there are no size limits for tuna so they are keepers. 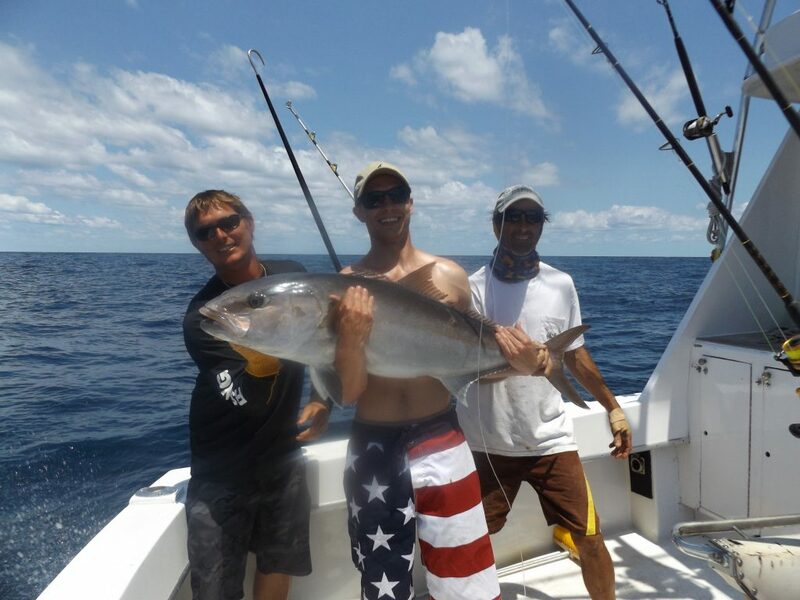 Bigger tuna are mixed in with them too and blackfin tunas can reach sizes up to 30 pounds at times. Kingfish are here and biting decently. Slow trolling live baits works well for catching kingfish. They will be here in better numbers in June – August though, when the waters warm up. Mahi are elusive and you have to go out in search of them, but they do school up so if you find them it could be a goldmine of fish. You have to work to catch them though and put in a lot of time trolling offshore to find them out there. Sometimes they even venture in on the reef and we catch them when targeting other species… bonus! Wahoo we catch when trolling and you catch them when you least expect it. Maybe the bonitos are biting and you are catching bonito, bonito, bonito, but then suddenly you get a bigger bite and it happens to be a wahoo. You catch all of these pelagic fish by trolling and you never know what you’re going to catch. That’s fishing! Wrecks are holding some good fish too. Amberjacks are the big game fish on the wrecks these days and they are biting excellently. May is probably the peak month for our amberjack fishing and these AJs are some of the strongest fighting fish you will ever come across. They are pure strength and put on a helluva fight, even on our heaviest tackle. No other fish puts on as strong a fight as these bruisers do. And the fact that they are so aggressive makes them a great target on our half day trips where fishing time is limited. Big groupers and cobia are other bottom fish you may catch when dropping live baits down around the shipwrecks. The great thing about wreck fishing is that you can do it quick. We hover over the wreck and drop a single rod down to the bottom with a live bait. If you don’t get a bite in the first 5 minutes, reel it in because no one is home. Go to another wreck, rinse and repeat. It’s fast fishing for big game results and that’s why I like it. And you never know what else might be lurking down there. From tilefish to barracuda, horse-eyed jacks to big game sharks, you can catch anything around the shipwrecks in 200-400ft of water. May is my favorite month to fish in Fort Lauderdale. Everything is in season and there are some big ones around. My advice is to try to fish when the weather conditions are less favorable. Flat calm sunny days are nice to be on the water, but the fishing is much, much better on the rough days with stormy skies with a lot less boats on the water to compete with. Of all the year, May gives you the most potential to come home with a great catch. Not every day is that banner day, but every day has the potential for greatness. Good luck on the water everyone. I’ll sea you on the water! Big amberjack caught deep dropping on a 250ft deep shipwreck. Great Fishing in Ft Lauderdale! And the Catching Ain’t Half Bad Either. Another great week of fishing in Fort Lauderdale. Dolphin continue to bite well in 300-600ft of water. They are scattered but if you spend some time looking for them, they’re out there to be found. 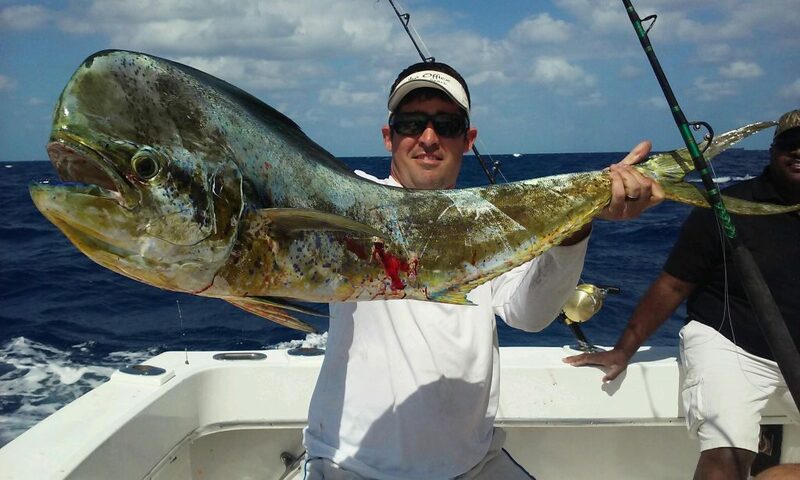 Trolling is the best technique to catch dolphin as you can cover a lot of territory and fish different depths and zones until you find a lucrative area that looks lively. Weeds, birds, floating debris are all golden when you are looking for mahi-mahi. Dolphin range anywhere from 5-40 pounds this time of year, much larger than the average size the rest of the year. This is the month the bigger dolphin show up in south Florida and do their annual spawn. Plenty of other fish are biting, but dolphin are the most popular… everyone wants to catch dolphin. They are good eating, good fighters, an awesome gamefish and they put on a cool show with their jumping and head shaking while on the line. Not to mention they are about the prettiest fish in the ocean with all their colors lit up. Lots of tunas caught on this trip along with kingfish and snappers. Tunas are also biting out there, lots and lots of them. They are schooling up and balling up all the baitfish, busting them on the surface. They are pretty easy to catch this time of year and not hard to find. You can see them almost a mile away, lots of whitewater on the surface as they bust the small baitfish they have corralled up to the top of the water in a piranha-like fashion. A lot of the tunas we are catching a football sized fish, which aren’t big, but there are no size limits on tunas so they are keepers and the small ones are great eating. A few bigger ones are also biting here and there, in the same areas. The bigger ones tend to stay deeper, underneath the smaller busting tunas on the surface. Natural feathers work very well for tunas when trolling or natural ballyhoo work well too. Don’t forget fluorocarbon as tunas shy away from heavy leaders or wire. 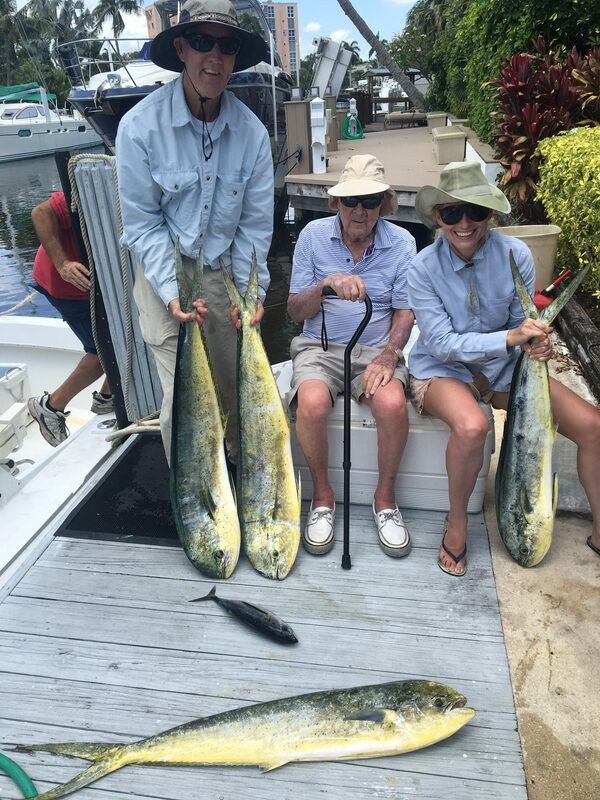 Nice dolphin catch on our sportfish trip in Fort Lauderdale. When action on the troll slows down or you just can’t find any pelagics, look to wreck fishing to save the day. There are some really big fish around the wrecks this time of year. Amberjacks are perhaps the most fun, strongest fighting fish in the ocean to give you a good workout on your rod. May is one of the top months of they year to catch amberjacks around our shipwreck in 200-400ft of water. They are incredibly aggressive fish so if you’re in a good spot (like a shipwreck), you don’t need to wait long to get a bite. They are either there or they aren’t. If you don’t get a bite in 3-5 minutes when fishing a wreck, try a different wreck. And wreck fishing also got another boost this month. Grouper season is finally open!!! Black groupers are biting great around the wrecks. Having not been harassed for the past 4 months, groupers have recovered and are now repopulating their usual holes. 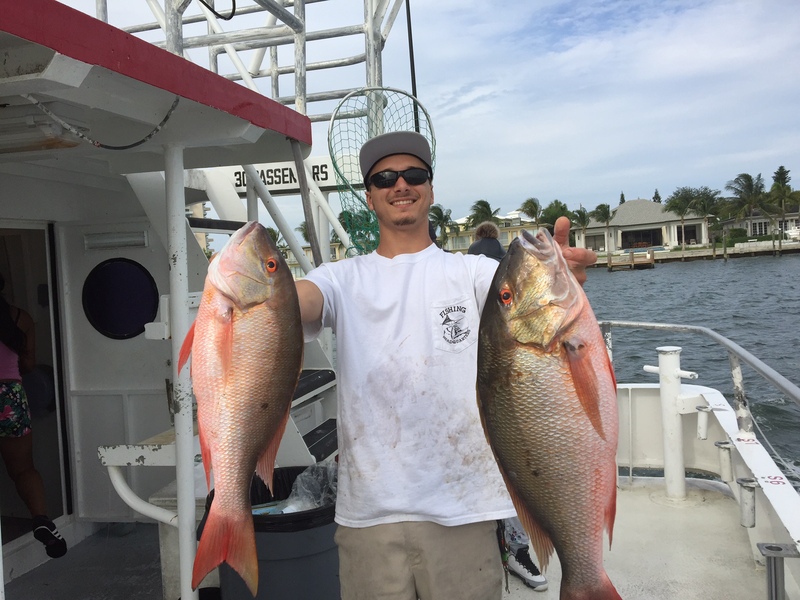 Snappers too, vermillion and mutton snappers are biting on the deep wrecks and can add color and flavor to your day’s catch. 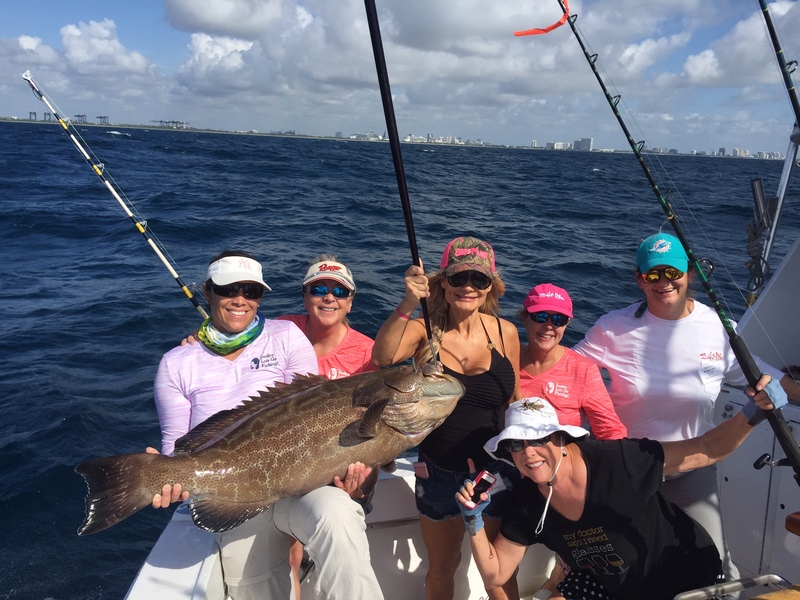 Huge black grouper caught by Betty and the gals from Ladies Let’s Go Fishing! There’s plenty of nice fish biting this month, you just have to go out there and put in your time. Some days are better than others, but there isn’t any month of the year that has more potential for big fish and good catches than fishing the month of May in south Florida. From dolphin, wahoo and tuna to amberjacks, grouper and snappers, there are plenty of fish out there to be had. Good luck to everyone fishing this month. I’ll sea ya on the water!